Fall Tech Has the Solutions and Answers! I have fall protection equipment from a previous job. Can I use the same equipment on a new job site? Every job site is different and contains its own unique challenges and fall hazards. While most fall protection equipment today is manufactured to be versatile, that doesn't guarantee that what was used on the last job is the best solution for a new job site. Some applications require job-specific equipment to ensure the safety of workers. For example, those working in fields that do welding or electrical maintenance require a harness made with special materials that offer fire resistance and arc flash protection. The type of lanyard or self-retracting lifeline needed may also change, depending on things such as anchorage locations, fall clearance, and the set-up of the job site. Fall protection equipment will not keep workers properly protected unless it is the right equipment for the job and is used properly. Don't forgo researching the job site and auditing safety equipment in an effort to save money. Instead, work with a qualified distributor or equipment manufacturer to figure out exactly what is needed. If you don't have the right equipment for the job, you're not fully protected. What is fall clearance and swing fall? Fall clearance is the minimum vertical distance a worker needs in the event of a fall to safely arrest the fall and avoid striking the ground or an object below. It's crucial to understand that fall clearance is more than just the simple measurement from a worker to the nearest obstruction. 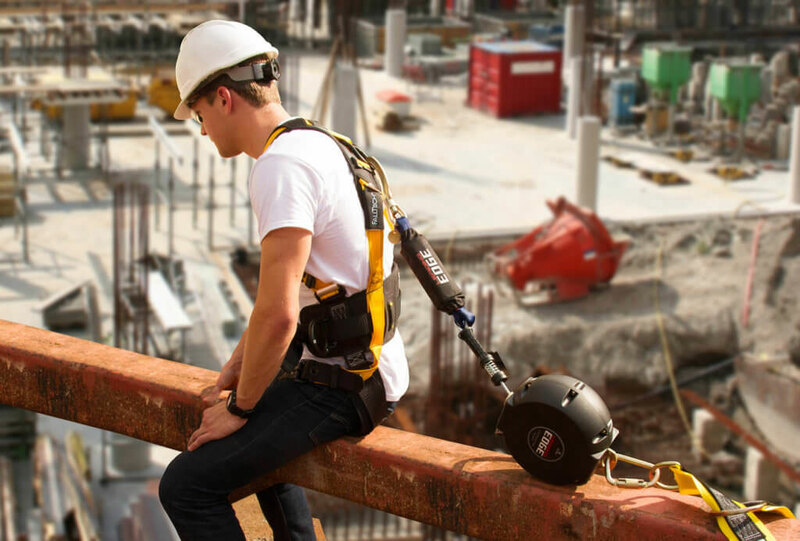 Other factors to consider include deceleration distance, the height of the worker, and whether a shock-absorbing lanyard or self-retracting lifeline is being used. In fact, a correct calculation could mean the difference between serious injury and a safely arrested fall. If the distance between the anchorage point and the nearest obstruction is less than the calculated fall clearance distance, the fall arrest system cannot effectively protect a worker from the dangers of a fall from height. A swing fall is a pendulum-like motion that can occur when the worker falls and their connector device is in a position located horizontally away from the anchorage point and not directly above the worker. In such situations, swing fall distance must also be taken into account. Because a swing fall generally lengthens the overall vertical fall distance, clearances must be appropriately adjusted. How do I calculate fall clearance? Fall clearance is the minimum distance a worker needs in the event of a fall to avoid striking the ground, or other object below, before the fall is arrested. It's crucial to understand that fall clearance is more than just the simple measurement from a worker to the nearest obstruction the correct calculation could mean the difference between serious injury and a safely arrested fall. To calculate fall clearance accurately, there are multiple factors to consider. The proper calculation formula to use for energy absorbing lanyards is the length of the lanyard + the deceleration distance of the energy absorber + the height of the worker + a safety factor. A distance of 1.5 feet is commonly used as a safety factor. If the distance between the anchorage point and the nearest obstruction is less than the calculated fall clearance distance, the fall arrest system cannot effectively protect a worker from the dangers of a fall from height. For situations in which the anchorage is not directly above the worker, swing fall distance must also be taken into account. Because a swing fall generally lengthens the overall vertical fall distance, clearances must be appropriately adjusted. Additional charts and formulas are also available for other fall protection connecting systems, such as self-retracting lifelines. What are the ABCs of Fall Protection? A typical personal fall arrest system is made up of four necessary components. The ABCDs of Fall Protection is a commonly used abbreviation to remember the following four components. Anchorage - The anchorage is the secure point of attachment. Anchorage connectors vary by industry, job, type of installation, and structure. It must be able to support the intended loads and provide a sufficient factor of safety. Body wear - A full body harness is the most common type of body wear. Harnesses distribute fall forces over the upper thighs, pelvis, chest, and shoulders and provide a connection point on the worker for the personal fall arrest system. Connector - A connector, such as a shock-absorbing lanyard or a self-retracting lifeline, connects a worker's harness to the anchorage. Descent/Rescue - These are devices used to raise or lower a fallen or injured worker to safety or retrieve the worker from a confined space. It is not uncommon for this component to be overlooked. What is the difference between OSHA and ANSI? OSHA (Occupational Safety and Health Administration) and ANSI (American National Standards Institute) are both important organizations focused on keeping workers safe. While there is some overlap between the two, their roles are ultimately different, and they should not be confused. OSHA is a division of the U.S. Department of Labor charged with setting and enforcing safety regulations in the workplace. OSHA also provides training, outreach, education, and assistance to workers in order to facilitate awareness and understanding of such regulations. OSHA regulations are governing law and therefore mandatory in nature, meaning all workplaces/employers must comply. Those who do not comply can face serious consequences, including citations and hefty fines. ANSI exists to promote and facilitate voluntary consensus standards, some of which are aimed at improving worker safety on the job, such as the Z359 series for fall protection. ANSI standards are intended to serve as recommended guidelines and often go more in depth than OSHA regulations. However, unlike OSHA regulations, ANSI standards are not mandatory, and following them is not required by law. While manufacturers and employers can choose to ignore ANSI standards without facing any monetary penalty, doing so could (and often does) place worker safety in jeopardy. While OSHA regulations are established to ensure safe working conditions, due to the lengthy process involved in updating regulations, they often fall short of delivering the most comprehensive and up-to-date safety information. ANSI standards, on the other hand, are generally more current, requiring revision or reaffirmation every five years, and represent the thinking of industry experts from all stake holders. In general, these consensus standards serve as more all-inclusive, easy-to-understand safety reference materials. Do not overlook the importance of ANSI standards and the value of being ANSI compliant. Even though OSHA and ANSI are separate organizations, the regulations and standards related to safety and health are of paramount consideration for both. In that sense, they are deeply intertwined and should be used together to enhance and strengthen the safety of workers. Those who truly put safety first are known to actively follow all applicable OSHA regulations and ANSI standards. No. Both OSHA and ANSI standards indicate that snaphooks and carabiners should not be connected to each other. The hook also needs to align with the applied load if connected to the eye of another hook, the hook may not be able to move or rotate when a load is applied. Compatibility between the two connections may also be a concern. Should you wear a Full Body Harnesses over or under winter clothing? What is the capacity of a Shock Absorbing Lanyard? The lanyard has a 130-310 lb. capacity when used for a maximum allowable free fall up to12 feet. It can also be used for capacities of 310-420 lbs. with a maximum allowable free fall up to 6 feet. Is it acceptable to attach your fall protection system to scaffolding? Yes, if the scaffold will support the potential loadings, and the scaffold manufacture approves such use, you can attach your fall protection system. Make certain your connecting hardware incorporates hooks large enough to fully close and lock when attached to the scaffolding (ex. Lanyard with rebar hook). Also make sure the connecting hardware (snap hook) is allowed to be used in this orientation. We suggest resist-coated web products. Resist-coated webbing is polyurethane and will allow the web to be cleaned much easier. Capital Safety offers several DBI-SALA brand harnesses, lanyards and anchor straps that incorporate the specialized resist-coated web. What is the maximum free fall distance allowed by ANSI and OSHA standards? What does the statement "100 percent tie-off fall protection" refer to? The term "100 percent fall protection" means that, at all times when a person is exposed to fall hazards (when at or above a given height), he or she must be protected by an active or passive fall protection system. Active systems include fall arrest systems such as a full body harness, lanyard and anchor point. A passive system could be a guardrail or net. The ANSI Z359.2-2007 code recommends less than six minutes to make contact with the subject. As a part of the fall protection program, both internal and external rescue services should be evaluated to determine which options are most desirable. OSHA, on the other hand, requires the provision of medical aid within four to six minutes. WHAT TYPE OF FALL PROTECTION SYSTEM DO I NEED? The type of system will depend on the environment and work to be performed. Fall protection systems are divided into fall restraint (prevents user from reaching a fall hazard), fall arrest (arrest fall of user in the event of a fall) and suspended access for operating a motorized platform or other suspended equipment.